State of the art lakeside accommodation – the ground floor sleeping twelve in six bedrooms. The stunning accommodation is located in Noballio, an old fishing village where water taxis or self sail/drive boats can be hired to explore the Lake. It’s also just a kilometre from Menaggio’s pedestrianised town square, edged with pavement cafes and shops and connected by a lakeside promenade to a lido with two pools and a sandy beach. Menaggio is only a short ferry ride away from the facilities and attractions of Bellagio and Varenna and the sightseeing attractions of the western branch, including the historic Villa Carlotta, as well as being close enough to Milan, Bergamo and St Moritz for day trips. Lake Como is a resort for all seasons, with vineyards open for wine tasting in October, a ski resort just an hour away and the cultural riches of Milan available all year round. Facilities The Villa is spacious enough to host large groups, both inside and out. The huge, 130 square metre terrace, situated directly on the Lake, is the ideal venue for family gatherings, wedding parties or even conferences and includes facilities for al fresco dining, a hot tub, sunbathing or just taking in the hypnotic panoramic views of the Lake and mountains. Sailboats (with lessons if needed) and speedboats can be hired at the marina in front of the villa and water taxis can also be arranged. The parking area for this unit has space for four cars. 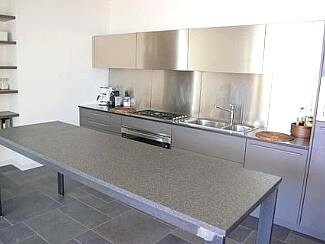 Inside, there are two large living areas with large, comfortable sofas and a fireplace to warm the winter nights; a flat screen TV/ DVD with selected satellite channels and internet access available and large dining tables, while the state of the art stainless steel kitchen, with coffee maker and all mod cons, is ideal for cooking up an Italian feast. The interior also enjoys remote control air conditioning and views over the Lake from every room. The six double bedrooms all have private bathrooms, with shower and WC. Mid-week refreshment of linen, bedding and towels. 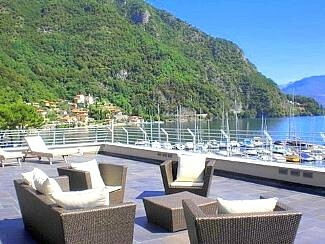 The accommodation is 1.5k from the centre of Menaggio, situated half way up the western side of the Lake with ferry connections to the towns of Bellagio and Varenna that complete the popular mid-Lake triangle. Facilities in Menaggio include a lakeside boulevard with mini golf, a Lido with a beach and two pools and a historic golf course in the hills. The ski resorts of Madessimo and St Moritz are one hour and ninety minutes away respectively. The many attractions of Milan, including La Scala and the Last Supper, by Leonardo, can be reached in ninety minutes and a private mansion, the Villa Carlotta, with its historic house and large gardens is just a few minutes away. Please ask for details of special interest holidays available.